We’ve teamed up with the expert rock climbers at Devil’s Lake Climbing Guides to offer a climb, camp, canoe package. This option is perfect for scout groups, corporate retreats, or small groups that want to book an entire weekend of multiple outdoor activities. You can spend a day in Spring Green where we’ll get you on the river for a full day of canoeing and kayaking and if you want to turn it into a three day weekend, camp out overnight. You’ll pass by hundreds of island sandbars where you can pull up and hang out for a few hours, have some drinks, play ultimate frisbee or maybe build a makeshift golf course. These are the same sandbars you can camp on. 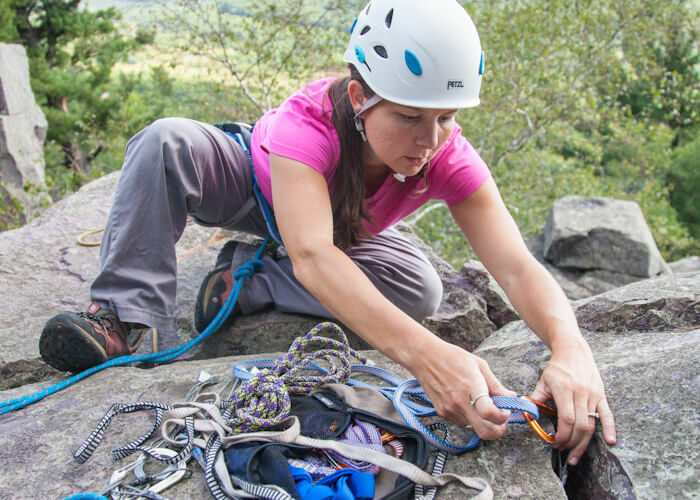 The next day, you’ll start bright and early at Devil’s Lake State Park where PCGI certified instructors will introduce you to the world of rock climbing with an emphasis on safety, learning, and fun. Start out on moderate, low-angle rock to help you get the feel for vertical movement, then progress at your pace to similar or more difficult climbing routes. By the end of the day you’ll understand the basics of vertical rock climbing so you can feel comfortable climbing at a local gym, tagging along with friends, or coming back for a more advanced climbing trip. Pricing is based on dates and number of people in your group. You can contact Nick @ Devil’s Lake Climbing Guides for questions about the climbing aspect of your trip (nick @ devilslakeclimbingguides.com) or us for the canoeing aspect. Receive 5% off your reservations by using discount code “DLCG” on our reservation system and mention the Canoe Camp Climb trip to Nick when booking your climbing trip.